Current Temperature: 43.9°F at the NCAR Foothills Lab, in NE Boulder. Want to see what the weather is really like? Visit the Boulder area webcams page or the Denver–Boulder National Weather Service Forecast Office. 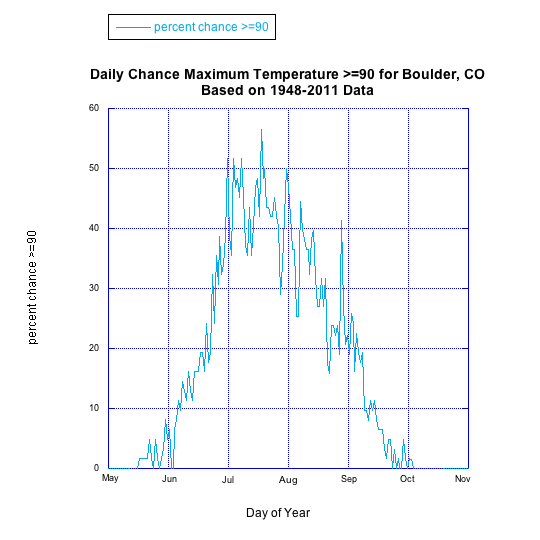 Chance of >= 90°F in Boulder! Current Temperature: 43.9°F at the NCAR Foothills Lab in NE Boulder. Also see the NREL National Wind Technology Center's weather conditions site. Daily Weather Observations 1947–Mar 2019 : temperature, rainfall and snow. Colorado Climate Center has historical Colorado Station Data, Standardized Precipitation Maps and Daily Real-Time Data for Selected Stations. A Good Source of Colorado Data! Boulder Allergy Information from the Weather Channel.